Changes were made in response to feedback received through a wide variety of public meetings, events, online surveys, written submissions and in-person presentations. When Colwood Council is faced with decisions about growth and new development, improvements to parks and other public spaces, projects for roads and infrastructure, and more, they look to the Official Community Plan to determine whether it fits with the community's long range vision. Colwood Council will make decisions about updates to the Official Community Plan. Citizen input is the most critical part of creating a clear identity for Colwood that can be implemented through strong plans and policies. 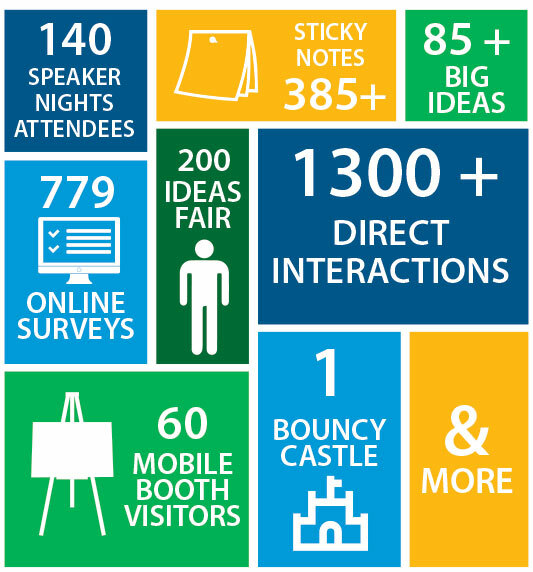 Between July 2016 and June 2018, the City worked hard to offer as many ways as possible for citizens to have their say - community talk back events, sounding boards in local eateries, online surveys, steering committee meetings, a one-day big ideas fair, and workshops with various groups, including seniors, students, parents, members of the business and development community, as well as Colwood staff and Council. Thousands of people have contributed to the draft plan. There were three phases to the project: Outline priorities and bold ideas, Develop the plan together, and Review & finalize the plan. The information below gives an overview of just a few of the conversations taking place. View the full list of Engagement Events to date. Review 2018 Colwood Official Community Plan. Get a sense of what the draft plan contains in the OCP Overview. From October 2016 to May 2017, citizens and partners shared ideas about their vision for Colwood to help shape the plan. Thousands of responses were recorded and incorporated in to the plan through talk back events, sounding boards, online surveys, events, workshops and steering committee meetings. The input was analyzed along with detailed research and data about Colwood. Vital to the OCP’s success is a widely shared understanding of the City’s vision, goals and direction. In September and October 2017, the City shared information about these directions widely, and sought feedback and input. Waterfronts: vibrant people places or protected natural areas? The City wants to hear what you think of the draft vision and goal statements. They seek to capture the most important themes expressed by participants to date, with an emphasis on Colwood's unique attributes and aspirations. While a small number of goal statements were developed to make them easier to remember and heighten their impact, several other sub-goals or objectives will be developed for the OCP to ensure comprehensiveness. The example policy directions will also be further evolved once preliminary input is received. Colwood is a spectacular seaside community set apart by its outstanding natural setting and exceptional quality of life. Colwood's waterfront is a gently-enjoyed, world class destination for residents and visitors alike. Residents have realistic transportation options. Vibrant streets & public spaces promote community connections. Colwood is carbon neutral, energy positive and water smart. Colwood is prepared to adapt to a changing world. Read the full Draft Vision and Goals document. 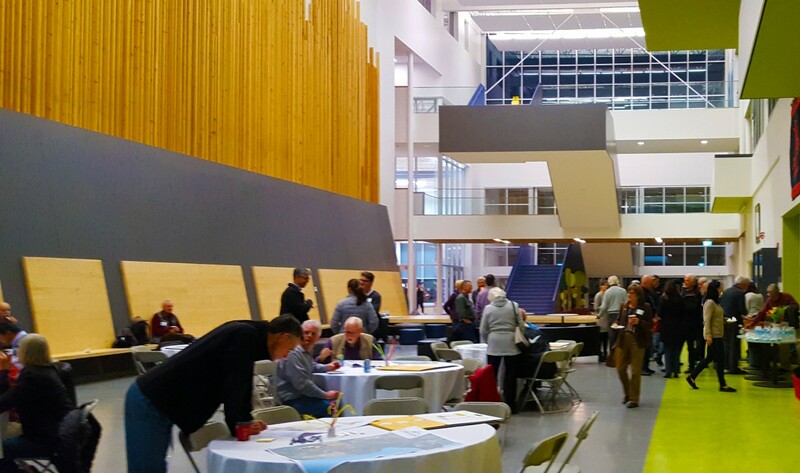 On June 3rd the City hosted an engagement event at the beach to present the Draft Vision and Goal Statements to the public for review and input. Approximately 75 people participated, and enjoyed food and music as part of the Beach Food event at the same time. Read the Engagement Outcomes from the Beach Event: Draft Vision & Goals. On Monday, February 27, 2017 the Phase 1 Engagement Summary was presented to Council. (This is a large pdf that may take time to load.) This information will be used to develop the draft vision, goals and strategic directions for the plan, which will be brought forward for public review and comment in the Spring of 2017. OUR HEART TODAY IS COLWOOD CORNERS, ROYAL BAY IS A HEART OF THE FUTURE: These centres need to be vibrant ‘people places’. It’s a challenge and an opportunity. OUR SOUL IS THE WATERFRONT. Our waterfront and natural assets are what we cherish and what makes us special. We want to protect, enhance and celebrate these areas. STREETS FOR PEOPLE. Our streets must be places for people. We want safer, more enjoyable walking and cycling experiences. TRANSPORTATION CHOICE. Real transportation choices are needed. We want better transit options, particularly for commuting. Congestion must be addressed. PLACES TO GO AND PLACES TO GATHER. We need more people-centred destinations and gathering spaces, ranging from neighbourhood cafes and pubs, to recreation and cultural spaces, to amenities at the waterfront that allow us to spend the day there. A BIG OPPORTUNITY. Royal Bay is a tremendous opportunity in defining our waterfront and creating a needed village centre. We must get it right. During October and November, Sounding Boards were placed in several locations to raise awareness about the Making Waves project and allow people to provide input 'in the moment'. 256 responses were recorded on boards placed at City Hall, Red Barn Market Latoria Walk, Royal Bay Bakery, Bitez Sandwich Bar and West Shore Parks & Recreation. Transportation - 108 responses: improve walkability, upgrade cycling infrastructure, traffic calming and dedicated bus lanes. Regional transportation suggestions included light rail transit, ferry service and use of the E&N railway. Town Centres - 68 responses: Colwood Corners development completion, walkable town centres at Colwood Corners and Royal Bay waterfront, smaller centres at Allandale Lands, Kelly Road and Latoria Walk. Need for offices, restaurants, play areas, and seating. Trees and landscapes - 35 responses: Focus on preserving trees and green spaces, limiting large rock walls, mapping and protecting streams, lakes and watersheds. 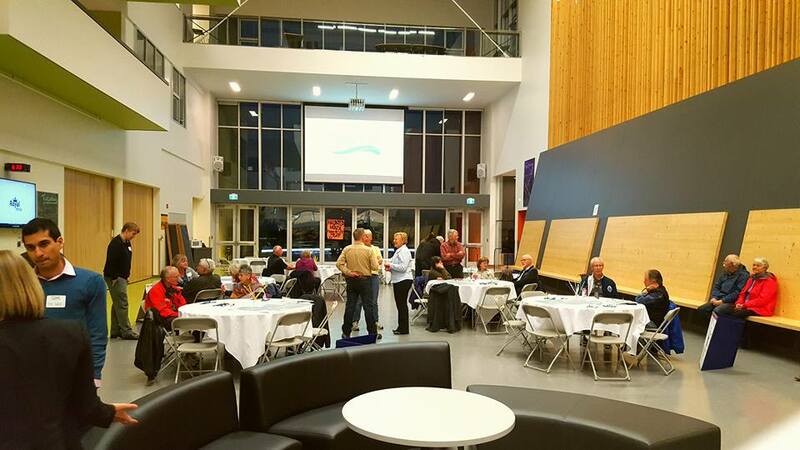 Approximately sixty people attended to talk about the future of Colwood. Conversations centred around four key topics: Town Centers; Trees and Topography; Transportation; and Tidelines and Waterfront. Participants identified where town centres are located currently in Colwood, and where future town centres could be located. They also discussed features and amenities that make Colwood unique, which natural features should be protected, and highlighted the areas where they feel development would be appropriate, as well as the type of developments and destinations these areas should have. 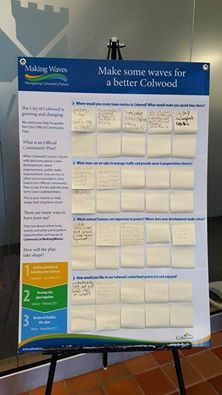 Several common themes emerged regarding where participants feel town centres should be located in Colwood, and what amenities they would like to see in each. Colwood Corners as a walkable commercial centre with office spaces, shops, services and eateries, as well as potential for tech and niche industry such as craft breweries. Walking and cycling connections throughout the center and into neighbourhoods was identified as a priority, along with outdoor seating, public spaces and features that add interest, such as murals and functional public art. People used words like gathering places, place making, sense of place, and cultural hubs. Royal Bay as a waterfront centre, branding Colwood as Victoria’s West Shore waterfront community, with boutique shops, restaurants, pubs, parks and public spaces, continuous waterfront access, ocean-oriented recreation, and an array of housing opportunities. Youth connections with the high school were discussed. Tourism opportunities were highlighted along the waterfront. Suggestions included a theatre, a pier, water taxis. Allandale Pit - The large private property off Allandale Road between Colwood City Hall and Veteran’s Memorial Parkway is seen as a potential centre for diverse housing, civic destinations, public art, recreation and playgrounds, with a mix commercial/light industrial anchors that complement the surrounding residential areas. Participants envisioned smaller village centres at Sooke and Kelly Roads; Lagoon and Metchosin Roads; and Latoria and Veterans Memorial Parkway. The Royal Roads lands came up frequently for the potential to create enjoyable walking and cycling connections between neighbourhoods and town centres. Discussion focused on preserving and enhancing Colwood’s trees, parks, watersheds and forested areas, as well as limiting hillside development that requires prolonged blasting and large retaining walls.There was support for creating a tree bylaw to manage tree removal. Participants expressed that they value their access to the ocean, beach and lagoon. There was interest in promoting enjoyment of beachfront areas while protecting some areas in their natural state – particularly the inner lagoon and bird sanctuary. There was strong support for some urbanization of waterfront areas adjacent to Royal Bay. Conversation focused on two distinct aspects: regional transportation issues, and ideas for improvements within Colwood. For regional traffic, ideas like dedicated bus lanes, light rapid transit, rail service and ferry options were discussed. Within Colwood, ideas focused on walking and cycling connections, increased transit, vehicle speeds and improved infrastructure. Work and build partnerships with Royal Roads, Department of National Defense and other stakeholders to enhance preservation of their lands within Colwood. Participants were asked to highlight the natural features they value in Colwood, and identify areas that may be appropriate for new development. They pointed out important local ecosystems, and suggested actions that the City could take to preserve natural amenities. Preserve Hillsides: both the views from- and of- hills are important. Approximately 70 participants attended to hear Dr. Dave Witty speak about how successful cities around the world use placemaking to create community spaces where people enjoy spending time — places that are designed with proportion, scale and vitality — animated and playful places with a strong sense of place that create a community identity and contribute to a high quality of life. He pointed to research that shows how much places can affect our view of the world. Boring places may make people tired and depressed, whereas places that are thoughtfully designed create a pride of place, a sense that you are part of something that has value. He stressed the importance of having rigourous planning principles and design guidelines that make it clear to developers what kind of place they are designing for and contributing to. View Dr. Witty's slides which include beautiful images of placemaking done right. Participants dove into energetic table conversations about what kind of community Colwood is today, and what kind of community it should become over time. The majority of participants agreed that Colwood is currently a 'bedroom community' where many people leave the community to work, come back to sleep, and may enjoy leisure time in the outdoors, but are often driving out of town for shopping and social activities. Celebrate heritage - from First Nations through settlement and miliary - through events, public art and music. The Making Waves survey was an interactive online feedback tool designed to gather broad community input into Colwood's Official Community Plan. 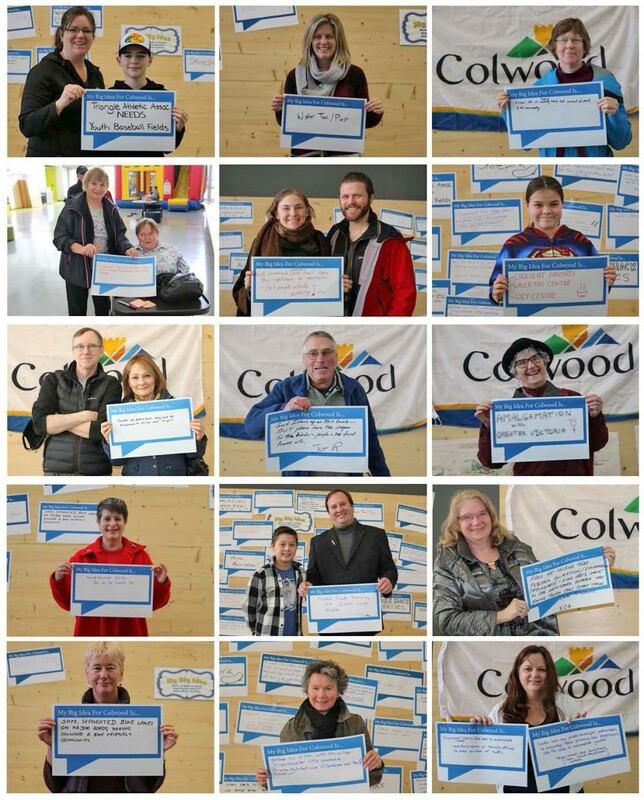 Between November 2016 and January 2017, users were able to drag their priorities to the top of the list to define Colwood's identity, mark special places on a map and select images that best represent their vision for growth in Colwood. As of January 31, 2017, there were 1076 visits to the survey. Here are some preliminary findings. B. Places: respondents marked the City Heart Today, City Heart Tomorrow, Special Places and Places Needing Help on a map. Comments about each marker on the map are recorded. C. Growth: Respondents choose the image that best represents how they envision growth in Colwood. Top ranked option for Transportation: "Streets that prioritize wallking and cycling environments" recieved an equal rating to "Streets that prioritize transit alongside other modes". Take a closer look at the data in this Making Waves Survey Summary Report.